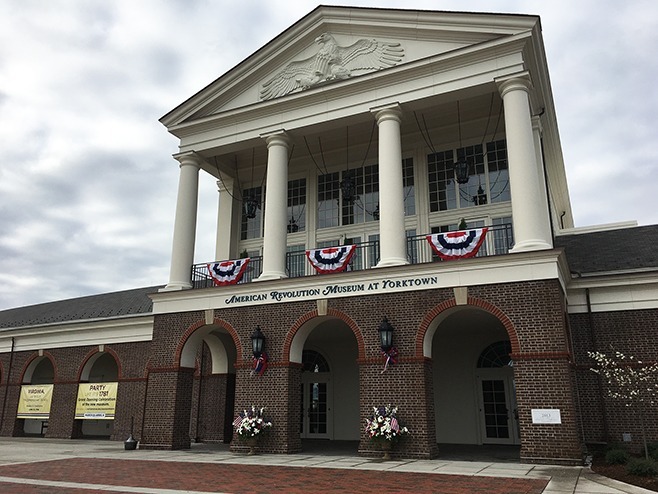 The American Revolution Museum at Yorktown was officially dedicated April 1, 2017, the high point of a 13-day Grand Opening Celebration saluting each of the first original 13 colonies in the order that they ratified the Constitution. 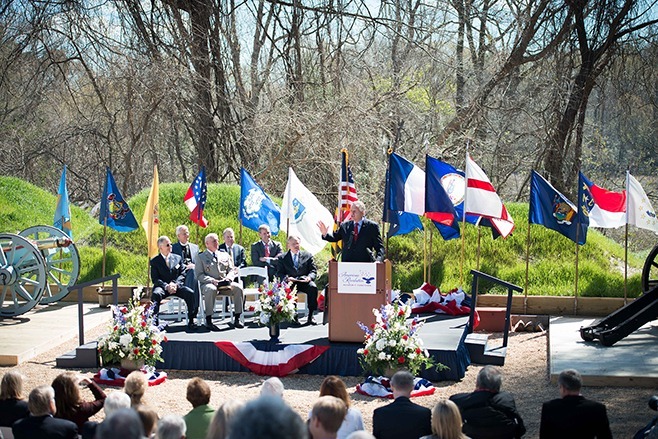 Virginia Governor Terence R. McAuliffe served as the keynote speaker and dedicated the museum to the late Nick and Mary Mathews, benefactors to the Jamestown-Yorktown Foundation who donated the land on which the museum is built. 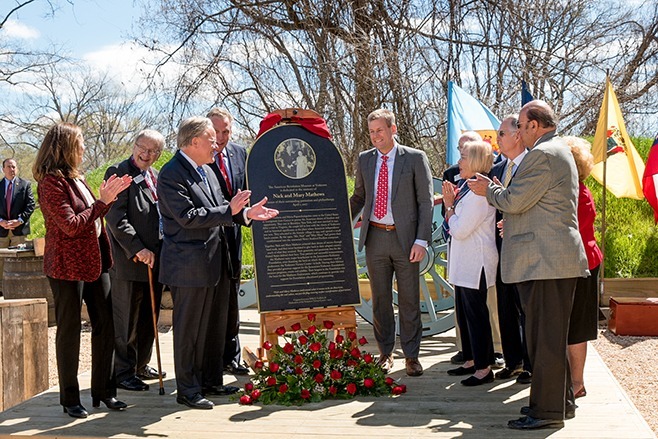 A plaque is revealed at the American Revolution Museum at Yorktown dedication ceremony on April 1, 2017, in honor of the late Nick and Mary Mathews, benefactors to the Jamestown-Yorktown Foundation who donated the land on which the museum is built and supported museum programs during their life and through their estate. The ceremony was followed by “God Bless America,” one of Mary Mathews’ favorite songs. The American Revolution Museum at Yorktown dressed up for Dedication on Virginia Day, April 1, 2017. 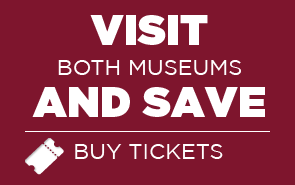 The American Revolution Museum at Yorktown achieved a crucial milestone with the October 15 public debut of an introductory film, permanent exhibition galleries, interactive exhibits and the new museum name. Throughout the immersive 22,000-square-foot exhibition space, visitors admired a coronation portrait of King George III, a July 1776 broadside of the Declaration of Independence surrounded by the names of those who signed the document, and exhibits outlining Revolutionary War conflicts in the southern states, including the Siege at Yorktown, and how America has influenced the world. After completion of a new outdoor living-history Continental Army encampment and Revolution-era farm, a grand opening celebration will be held in Spring 2017. Senior Curator Sarah Meschutt works with a mount-maker on September 1 to install a portrait of Benjamin Thompson, Count Rumford, in the American Revolution Museum at Yorktown exhibition galleries. Born in Massachusetts, Thompson was a Loyalist who emigrated from America and had a successful career as a scientist and inventor in Britain and on the Continent, where he was made a count in 1791. 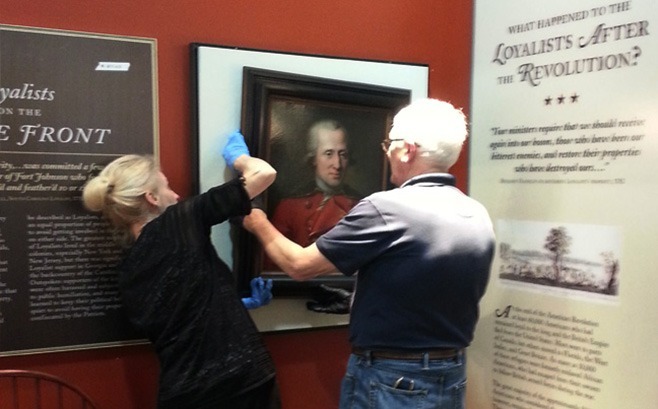 His portrait will help illustrate the story of Loyalists during the Revolution. Films and interactives are tested in preparation for the public debut of the American Revolution Museum at Yorktown galleries on October 15. 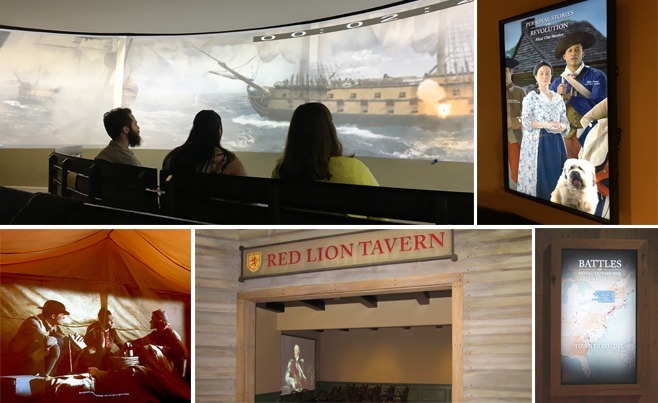 Shown clockwise, “The Siege of Yorktown” unfolds in an experiential theater with a 180-degree surround screen. Among computer interactives are Personal Stories of the Revolution, which incorporates a personality quiz, and Battles of the Revolutionary War. Within a tavern in a re-created wharf setting, a short film chronicles the evolution in the relationship between American colonists and the British government leading to armed conflict. Inside a tent that serves as a theater, “The First Great Victory” presents the story of the 1777 Battle of Saratoga, a turning point in the Revolution. Test installation of artifacts in display cases is underway in the permanent exhibition galleries. 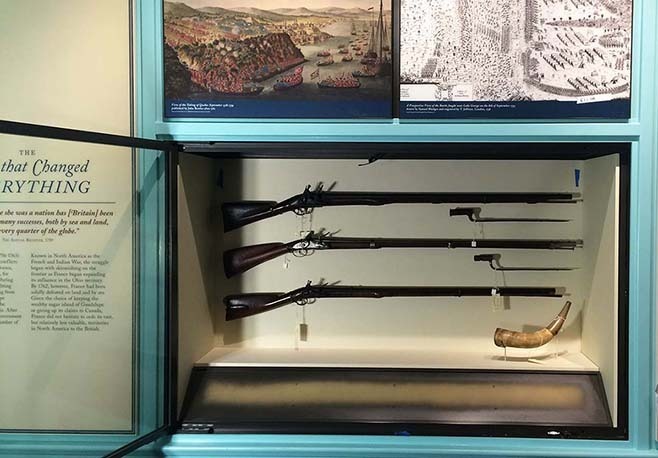 Pictured on August 1, in the first case visitors will encounter as they enter the galleries, are (top to bottom) a British Pattern 1742 land service musket dated 1741, a circa 1745 French Model 1728 (St. Etienne) musket, a circa 1750 early American (probably Virginia) long rifle, and an American powder horn inscribed “Jabez Hall 1757,” all in the collection of the Jamestown-Yorktown Foundation. The socket bayonets next to the British and French muskets are on loan from a private collection. 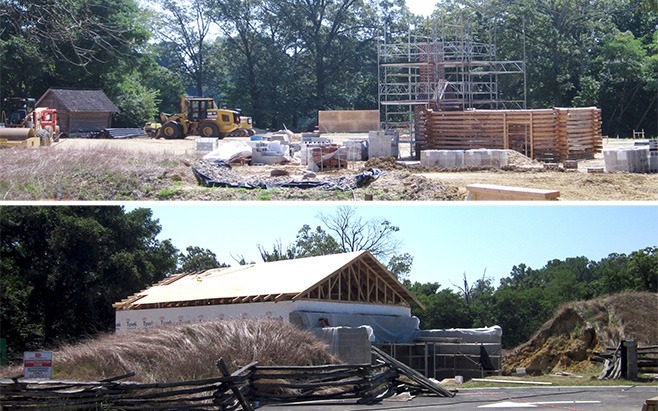 A log kitchen with an attached brick chimney a is taking shape at the Revolution-era farm site (top image). Construction also is underway on a visitor amenities building located next to the farm. One section of the amenities building will be accessible from the farm, the other from a future picnic area and visitor parking. Photographed on July 23, 2016. Photographs of the exhibition galleries on June 30, 2016, present a view of the Declaration of Independence exhibit from inside the tent-like theater where the “The First Great Victory” will be shown, and exhibit space where a life-size statue of George Washington that once stood in the U.S. House of Representatives will be placed. 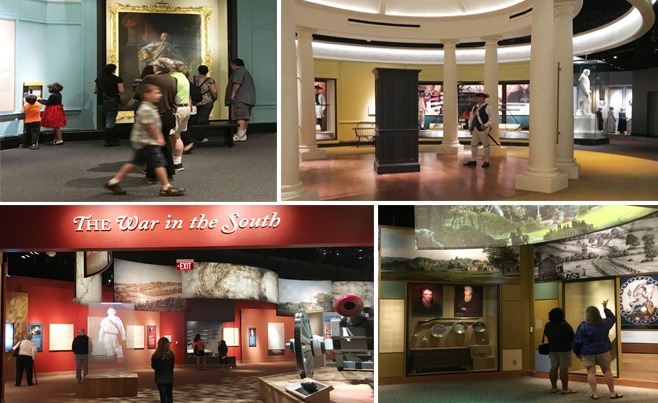 Special effects testing is underway on June 16, 2016, in the “The Siege of Yorktown” experiential theater located within the permanent exhibition gallery space. During the eight-minute film, the audience will experience smoke, wind, smells (gunpowder, sea water and coffee), and rumbling seats.